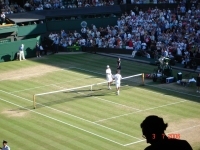 Louisa and I were lucky enough to get tickets through the public ballot for the second Monday (3/7/06) on Centre Court. We had good seats, although quite a way back. We had a great day, despite having to sit next to a huge American lady that I nicknamed "Jabba the Hut"! The second match promised so much but failed to deliver. It was Andy Murray vs Marcos Baghdatis. It finished 6-3 6-4 7-6 to Baghdatis. Next up was Roger Federer vs Tomas Berdych. It finished 6-3 6-3 6-4. It was a pleasure to watch someone who quite clearly is head and shoulders above everyone else...sheer class! As you will note, every match finished in straight sets. Only the 3 matches above were scheduled for Centre Court, so they laid on a another match; an over 35s doubles match featuring Henri Leconte & Goran Ivanisevic vs Neil Broad and Mark Petchey. It was great fun with Leconte still up to his clowning around tricks. He and Ivanisevic won 7-6 6-3. We then walked up to Wimbledon village and found a very nice Lebanese restaurant for some dinner...a great day out!